Among the most important aspects of risk and hazard studies relating to forest ecosystems are maximum forest density and density-dependent tree survival. Long-term observations about the maximum density of unthinned Pinus patula and P. elliottii field plots based on the Correlated Curve Trend (CCT) spacing studies which were established almost 8 decades ago by O’Connor (Forest Research with Special Reference to Planting Distances and Thinning, 1935) in South Africa. Three specific approaches were introduced for analysing maximum density and tree survival, namely the ‘limiting line’, Nilson’s sparsity and tree survival with the Weibull function. a) Maximum densities differ greatly among the two species grown on the same site and within the same species grown on different sites; it is possible to relate these differences to site index in both species. b) The relationship between the quadratic mean diameter and the minimum average spacing of surviving trees (known as Nilson’s Sparsity) appears to be surprisingly similar in both species. c) An analysis of tree survival in response to different initial planting espacements shows that the Weibull survival function parameters can be estimated if the initial planting density is known. This result is presented for each of the eight large experiments used in this study. This study contributes to a better understanding of tree survival and maximum density which are the key factors required for estimating risk and uncertainty. The risk of tree mortality is not constant, but varies with tree species, planting density, tree age and growing site. For estimating that risk, therefore, continuous long-term observation on different sites and with varying planting densities, as provided by the unthinned CCT series, are essential. Risk and uncertainty, – these words have initiated ardent debates and extensive interdisciplinary studies. What is risk? The choice between harvesting a tree or leaving it to grow is always risky. If the tree is harvested now, there is a risk that its future value could increase beyond expectations. If not, there is a risk of having missed a chance. It is not possible to escape this dilemma that is inherent in every decision (Weiss ). Risk has been defined as “the probability and magnitude of an adverse effect” (Lowrance ). More specifically, it is an expected loss caused by a potential hazard that may occur in a given reference area at a specific time. Obviously, there is a constant need to improve our ability to predict hazards. One that concerns forest ecosystems in particular, is density-dependent tree mortality which is also known as self-thinning (Yoda et al. ; Gingrich ; Drew and Flewelling ; Zeide ; Hynynen ; Luyssaert et al. ). Observations about the maximum density of a planted forest may be assessed in unthinned and sufficiently large field plots maintained over long periods of time. Ideally, the experiment should include planting densities ranging from very low to very high stocking. High planting densities demonstrate effects of self-thinning while low densities reveal how widely-spaced trees are capable of occupying available free growing space. The study sites should be observed throughout the life of the trees to eliminate age effects, and they should cover an area that will carry a sufficient number of surviving large trees at maturity. Such a design will provide information about the maximum density of a planted forest independent of tree age or average tree size. Accordingly, this contribution presents a study based on long-term observations of maximum density in unthinned Pinus patula, P. elliottii and Eucalyptus grandis field plots based on Correlated Curve Trend (CCT) spacing studies established by O’Connor () in South Africa. Maximum forest density may be one indicator of shifts in ecosystem response to changes in the climate (Grace et al. ; Greenberg et al. ). Observations about maximum forest density may thus provide a new powerful basis for environmental gradient analysis, for example in addressing the question: which are the site conditions that most affect the potential density of a forest ecosystem? Knowledge of maximum forest density, for example in the Tropics or in Boreal regions, will permit potential Biomass and Carbon Estimates and relate those estimates to observed values. In addition, the ability to predict maximum forest density will enable foresters to quantify the reduction of biomass and the loss in carbon sequestration by timber harvesting. This will permit more accurate and comprehensive comparisons of alternative “paths” of forest management (Gadow ). Thus, there are good reasons for improving our ability to estimate the potential density of managed and unmanaged forest ecosystems. Based on previous studies of long-term experiments in unmanaged forests growing at very high densities, we conclude that the problem of estimating potential density is not as trivial as it may appear. Accordingly, the objective of this contribution is to estimate the potential density of unthinned forests using a detailed and comprehensive dataset and specific modeling approaches, including individual tree survival functions. We want to investigate the effect of different growing sites on the maximum density of the same species and the maximum density of different species growing on the same site. This section presents details about the CCT spacing trials and the observations that were used in this study, and the methods that were applied. Direct assessment of the potential density, and of the development towards that elusive state, requires densely stocked unmanaged and sufficiently large field plots that are enumerated regularly during long observation periods. A rare example of such an elaborate experiment is the Correlated Curve Trend (CCT) spacing study established by O’Connor () in South Africa. The CCT experiment is a classic spacing trial designed to predict yields from plantations of various species of pine and eucalyptus for a wide range of densities, varying between extremely dense (2965 stems per ha) and free growth (124 stems per ha). Additional file 1: Table S1 shows details of the eight experiments used in this paper, and a map with their locations in South Africa. The original objective of the CCT study was to predict yields from plantations of various species of pine and eucalypt for a wide range of planting densities. Most of the experiments were established between 1936 and 1938 and several detailed descriptions of the CCT design were published during the past 70 years (see for example Craib ; Marsh ; O’Connor ; Burgers ; Van Laar ; Gadow ; Bredenkamp et al. ). Some relevant details of four spacing trials each for Pinus patula and P. elliotti are presented in Additional file 1: Table S1. The altitudes range from 53 m.a.s.l. (Kwambonambi) to 1400 m.a.s.l. (Nelshoogte), the mean annual temperatures from 15.9°C (Weza) to 21.8°C (Dukuduku) and the mean annual precipitation from 830 mm (Weza) to 1463mm (MacMac). Soil depths and geology were also assessed in each of the eight experiments. With a depth of 120-150 cm the soils are deep in all experiments. Humic soils on granite are encountered in the MacMac and Nelshoogte experiments, sandy soils in Dukuduku and Kwambonambi and red apedal dystrophic soils in Entabeni on basalt. The mean height of dominant trees at age 20 (SI20) is lowest for P. elliottii at Dukuduku (17.0 m) and highest for P. patula at MacMac (24.3 m). Further details are presented in Additional file 1: Table S1. The typical CCT experiment consists of 18 plots, covering 0.081 ha each. Nine of the 18 plots were left unthinned, the other nine were subjected to various thinning regimes. The treatment details for plots 1-8, and a map of the CCT spacing study Nelshoogte, are presented in Additional file 2: Table S2. The unthinned experiment, known as the Basic Series, provides information about the growth of unthinned stands for a wide of range of planting densities. In the other, known as the Thinned Series, the response to various thinning regimes may be assessed. Eight nominal stand densities, ranging from 124 to 2965 stems per hectare, were established in plots 1 to 8 of the basic series. In order to avoid suppression by competing herbaceous flora, all plots were initially planted at 2965 stems per hectare and then thinned ‘in advance of competition’ until the nominal stocking was achieved (for further details of the trial design refer to Bredenkamp  and Gadow and Bredenkamp , p. 55 et sqq.). In this study only the results from several basic series are used. Data from the CCT experiments are suitable for analysing tree survival in response to forest density and tree age. Additional climate and soil data have become available more recently, allowing a more detailed analysis of environmental effects. This section introduces three specific approaches for analyzing maximum density and tree survival. We define the rate of survival as the ratio N 2 N 1 while mortality may be expressed by N 1 − N 2 N 1 .
where Nmax is the maximum number of surviving trees per ha, D is the quadratic mean diameter [cm] and a0, a1 are empirical parameters which can be estimated from fully stocked, unthinned trials. Reineke () plotted the number of trees per unit area of “fully stocked stands” over their average diameter and concluded that the a1 parameter is a constant equal to -1.605 (Oliver and Larson , pp 353–354; Zeide ). If this equation is fitted to the data, the results are almost identical to those obtained with equation (1a). In both 1a and 1b, the dependent and independent variables have different units (N per ha and cm). with t >0. In this study, we will fit the survival function (Equation 7) to observed surviving P. patula and P. elliottii trees n years after planting and try to relate its parameters to the different planting espacements. The limiting line was fitted to the CCT experiments listed in Additional file 1: Table S1 and the parameter estimates for the eight datasets are listed in Additional file 3: Table S3. Not surprisingly, the value of a1 deviates considerably from the constant -1.605 proposed by Reineke (). Previous studies have shown that the exponent may assume a wide range of values, depending on tree species and site conditions (Gadow ). The relationship between the intercept (coefficient a0) and the site index is shown in the graph on the right of Additional file 3: Table S3. The results of relationships (8), (9) are based on four experiments for each of the two species. The database is limited. Nevertheless, to our knowledge, this is the first time that an estimate of maximum density could be related to site index. The range of site indices (17-24 m and 20-24 m) is relatively broad and covers a wide range of the growing sites where the two species are found in South Africa. The dramatic effect of the environment on the maximum density of the same species can be seen in Figure 1 which shows the limiting line fitted to Pinus elliottii MacMac using the 0.975 percentile data. Limiting line fitted to Pinus elliottii MacMac using the 0.975 percentile data (left) and the same line for MacMac and Kwambonambi with the log transformed variables. 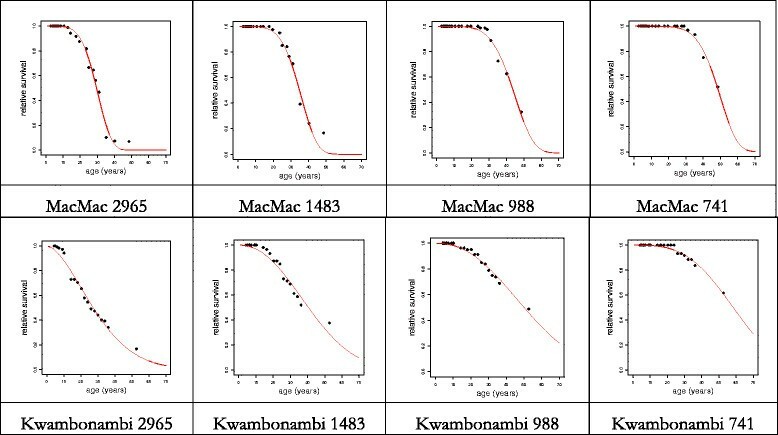 The limiting lines for the Pinus elliottii experiments in MacMac and Kwambonambi are also shown in Figure 1, with the log transformed variables. The lines are almost parallel and the difference between the intercepts in terms of maximum surviving trees for a given mean diameter is considerable. For example, for a quadratic mean dbh of 30 cm the maximum number of live trees is estimated at Nmax = 781116.5 ⋅ 30− 2.09 = 639 per ha in Kwambonambi and at Nmax = 1063674.8 ⋅ 30− 2.04 = 1032 in MacMac. Kwambonambi supports only 67 percent of the MacMac maximum and the difference between the two sites, given a quadratic mean dbh of 30cm, is 1032-639 = 393 P. elliottii trees per ha. The growing conditions are very different. Considerably more trees are able to survive on the cool mountain site at MacMac than on the warm subtropical sandy site at Kwambonambi. Estimates of maximum density with Nilson’s Sparsity. Left: for all Pinus elliottii trials; right: for all Pinus patula trials, both using the 0.025 percentile values and the R library quantreg. The four coefficients are highly significant, and surprisingly similar. The relationship between the minimum average spacing and average tree size is assumed to be linear, at least up to the point when the tree size does not increase sufficiently, but mortality continues. It appears that, after reaching an average dbh of about 60 cm, the trees start dying, not as a result of competition-induced self-thinning, but possibly because of other factors, such as failing defence mechanisms and reduced ability to survive pathogen attacks. Shvidenko et al. () describe the development of the number of trees per ha and the average tree diameter for fully stocked Pinus sylvestris forests in the forest tundra and northern taiga ecoregions in the European part of Russia. These data show a linear relation between L and D up to the age of 200 years. For the CCT data of the two pine species, the relationships appears to be linear up to a mean diameter of about 60 cm. Survival functions (Equation 7) were fitted to different planting densities of the two pine species in each of the four CCT experiments listed in Additional file 3: Table S3. Figure 3 presents examples of the fitted functions involving Pinus elliotti with four different planting densities of the CCT experiments MacMac and Kwambonambi. Examples of tree survival functions fitted to four different planting densities of the Pinus elliottii CCT experiments MacMac and Kwambonambi. The parameter estimates are listed in Additional file 4: Table S4. The four parameters of these two equations are listed for each of the 8 experiments in the last two columns of Additional file 4: Table S4. These results show that the Weibull function is suitable for estimating individual tree survival for both species and planting densities between 2965 and 741 trees per ha. The slope coefficients were significant in both equations, but the intercept was only significant in equation (15). Interestingly, the response of the two species does not appear to be different. However, it must be pointed out again that the database is too limited to draw general conclusions about the relationship between site index and Weibull parameters. The extensive South African spacing experiments, maintained for rather long periods of time, provide very important information for the scientific analysis of maximum forest density and tree survival. The “limiting line” approach presented in this study is an attempt to describe the relationship between average tree size and number of trees per unit area. Reineke proposed a slope constant of -1.605 which has been widely accepted and applied in many subsequent studies. Yoda’s 3/2 power line of ecology represents a similar attempt to explain self-thinning with a very simple model. Both models have been questioned by a number of authors, including Zeide (, ) and (Gadow ). This study has once again confirmed that a generalisation of the Reineke exponent cannot be substantiated by empirical observation, and that any model should be examined under a variety of specific conditions, before being labelled a “unified theory of ecology”. Nilson (; see also Hilmi ) argues that the most simple and logical relation is expected between variables of the same dimension, which is not the case in the Reineke model (Equation 1). For this reason, and because of its simpler form, Equation (3) was thought to be preferable when compared with Equation (1). A general discussion on the assumption of linearity of Nilson’s sparsity is not possible, because the CCT material does not cover the seedling stage and stands older than about 60 years. The tables published by Shvidenko et al. 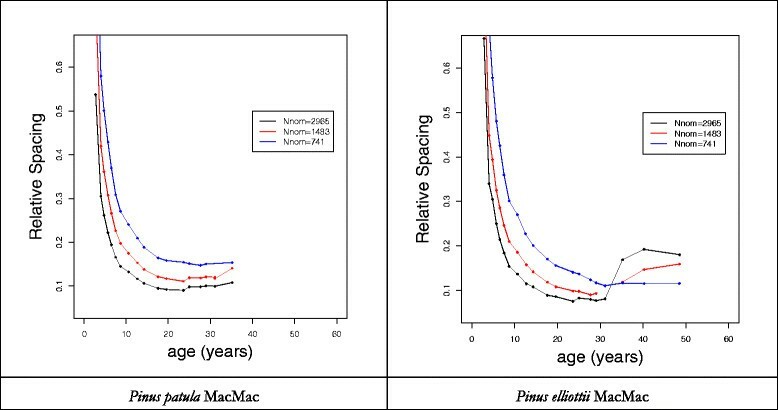 () for Russian Pinus sylvestris forests on site quality II show that Nilson’s sparsity is linear up to the age of 180 years. However, the available material shows that the assumption of linearity cannot be confirmed for the Pinus patula CCT studies. Considering the culmination of diameter increment of Russian P. sylvestris and the much faster growing P. patula in South Africa one might expect that a deviation from linearity, should it signify a general, species independent pattern, could be induced at much higher ages in P. sylvestris. It is known that stem diameter scales well with crown extension and thus light competition and that these relations are very species specific, at least for conifers, which might affect the relationship. The maximum density of a planted forest is usually unknown because of the high cost to obtain empirical observations that permit a credible analysis of that elusive natural phenomenon. In addition to the observations about maximum density, the CCT experiments provide information about the development of forest density. The development of relative spacing, the average distance between the trees divided by the dominant height, is shown in Figure 4. Development of relative spacing (the average distance between the trees divided by the dominant height) for two species and three different planting densities (2965, 1483 and 741 trees per ha). The minimum relative spacing (RS) in the Pinus elliottii experiment MacMac is 0.0752, observed at age 24. The minimum RS in the P. patula experiment MacMac is 0.095, observed at age 18. The maximum basal areas are 56.6 m2/ha at age 28 for P. patula MacMac 83.6 m2/ha at age 24 for P. elliottii MacMac. Maintaining a series of large field plots over long periods of time is expensive. One attempt to reduce such high costs is the design proposed by Nelder (). The compact Nelder design consists of a number of spokes of an imaginary wheel with trees planted at different radial distances, at the intersection of circular arcs and linear spokes (Barry ). Parrot et al. () discuss various aspects of the Nelder design which allows the effects of different planting densities to be examined in a single experiment. The experimental unit in a Nelder design is the individual tree and research usually involves to relating the available growing area of each tree to growth rates or tree architecture (Gaul and Stüber ; Mabvurira and Miina ; Aphalo and Rikala ). According to Affleck () the analysis of Nelder experiments is problematic because the compact arrangement of trees may result in significant correlations among neighbouring variables. Hall () notes that seedling survival is a primary concern when establishing Nelder plantings because a major drawback of the Nelder design is the sensitivity of the analysis to tree mortality (see also Stape and Binkley ). The compact Nelder design, although having a cost advantage, only presents observations about the relationship between available growing space, tree growth and tree architecture. The Nelder wheel does not provide information about maximum density and the analysis is usually limited to the juvenile stage (Gaul and Stüber ). As mentioned before, data about the maximum density of planted forests are very scarce because the cost of maintaining a series of unthinned, densely-stocked and sufficiently large field plots over long periods of time may be exorbitant. The CCT experiments represents, therefore, a valuable source of information for the analysis of maximum density and tree survival. Surprisingly few studies have used these unique datasets. This contribution is part of a thematic series on risk and uncertainty. It is therefore appropriate to relate the results to the overall topic. The scientific analysis of risk and uncertainty in the context of natural hazards had its beginning at the turn of the 18th century, when catastrophic events were no longer considered simple acts of destiny, but as relations of causes and effects (Weiss ). Plantation forest ecosystems have become an important strategic resource in a number of countries. Many industrial plantations are re-established after clearfelling and never thinned, especially those grown on short rotations and for maximum biomass, and their development resembles that of the unthinned CCT series. This study, therefore, contributes to a better understanding of tree survival and maximum density which are the key factors required for estimating risk and uncertainty. The risk of tree mortality is not constant, but varies with tree species, planting density, tree age and growing site. For estimating that risk, therefore, continuous long-term observation on different sites and with varying planting densities, as provided by the unthinned CCT series, are essential. Because of the particular risks involved in overaged plantations, such observational studies should be maintained as long as possible, preferably beyond the age of natural tree longevity. We wish to express our gratitude to all those who conceived and implemented the South African spacing experiments. Special thanks are due to the individuals who measured the trees and to the institutions, especially the former South African Forest Research Institute and its successors, who made these unique observations available for research. HK acquired and prepared the summary data. KGv did the data analysis and constructed the article. HK edited the final version of the ms. Both authors read and approved the final manuscript.